Workman Publishing Company, 9780761185512, 176pp. Celebrate the wisdom of the sandbox—the witty, innocent, surprising, and yet completely sensible things that kids say and do. A little book with a big heart, Really Important Stuff My Kids Have Taught Me combines deceptively simple life lessons with engaging images that together not only offer insight but inspire joy. Kids see the world in a way that adults don’t, so glimpsing life through a child’s eyes offers a fresh—and often funny—perspective. Kids encourage us to be open-minded: There are a lot of different ways to get to the top of the jungle gym. To be fearless: Jump right in or you may change your mind about swimming. To aim high: Even babies grab for things just beyond their reach. To be kind to yourself: Sometimes you need a Saturday on a Wednesday. To follow your own path: If the flowers you draw don’t look like anyone else’s, that’s good. And to stay young: Go barefoot! Tune in to the chatter on the playground, and remind yourself how simple everything really is. 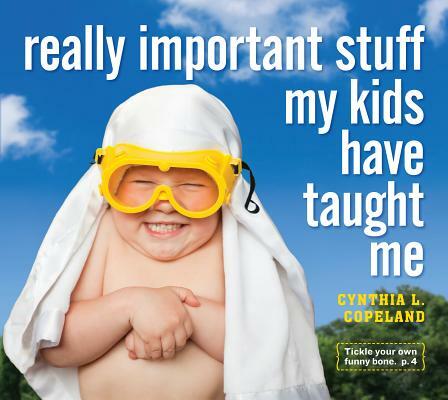 Cynthia Copeland is the author of the instant bestseller Really Important Stuff My Dog Has Taught Me and more than 25 other books, including The Diaper Diaries. Her books have sold more than a million copies and have been featured on Good Morning America, selected for Oprah’s “O List” in O Magazine, recommended by Ann Landers, and featured in Family Circle. Ms. Copeland lives in Keene, New Hampshire.